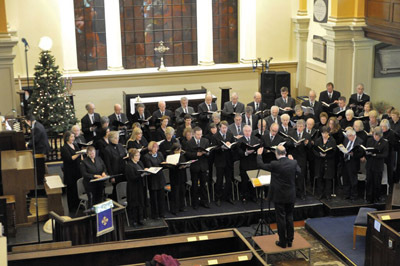 The Birmingham Bach Choir returns to the Jewellery Quarter for their always anticipated traditional Christmas service – Nine Lessons and Carols (Sun 20 Dec 2015, St Paul’s, Jewellery Quarter. (free/ donations). The Grade I listed ‘Jeweller’s Church’ is famed for its association with the great industrialists Matthew Boulton and James Watt and makes for a beautiful setting for a selection of enduring and familiar carols. Expect to hear such favourites as ‘Hark The Herald Angels Sing’, as well as some lesser known works by John Joubert, Herbert Howells and Gareth Treseder. Conductor and composer Paul Spicer’s new song ‘Now Is The Time Of Christemas’, commissioned especially for Birmingham Bach Choir, will also be performed. Monies raised from this service will be donated to doctors working in Aleppo, Syria.